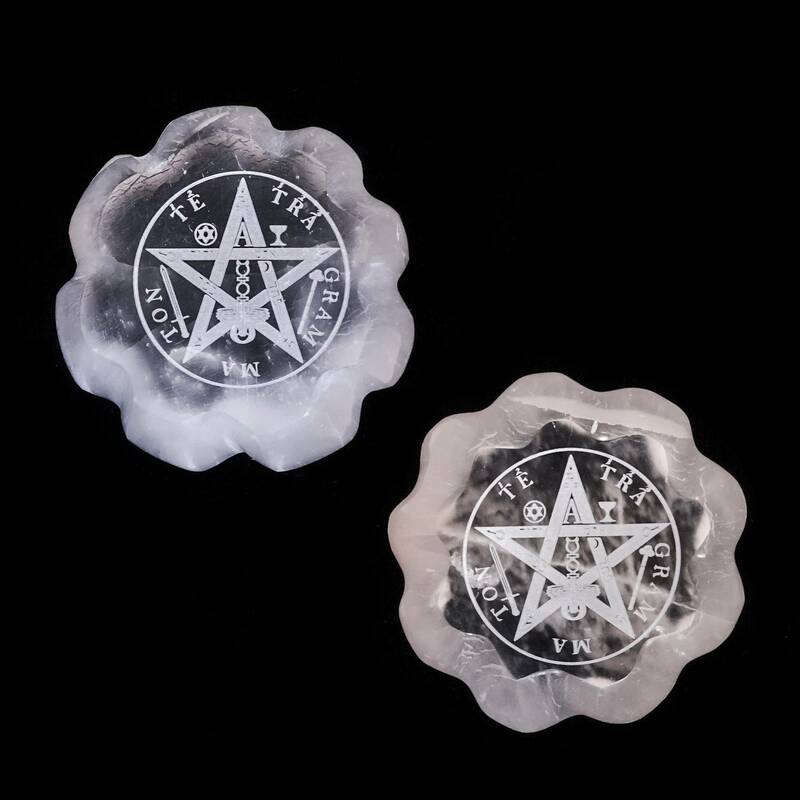 These tetragrammaton selenite discs engraved with the sacred geometry of the tetragrammaton are seriously magical. 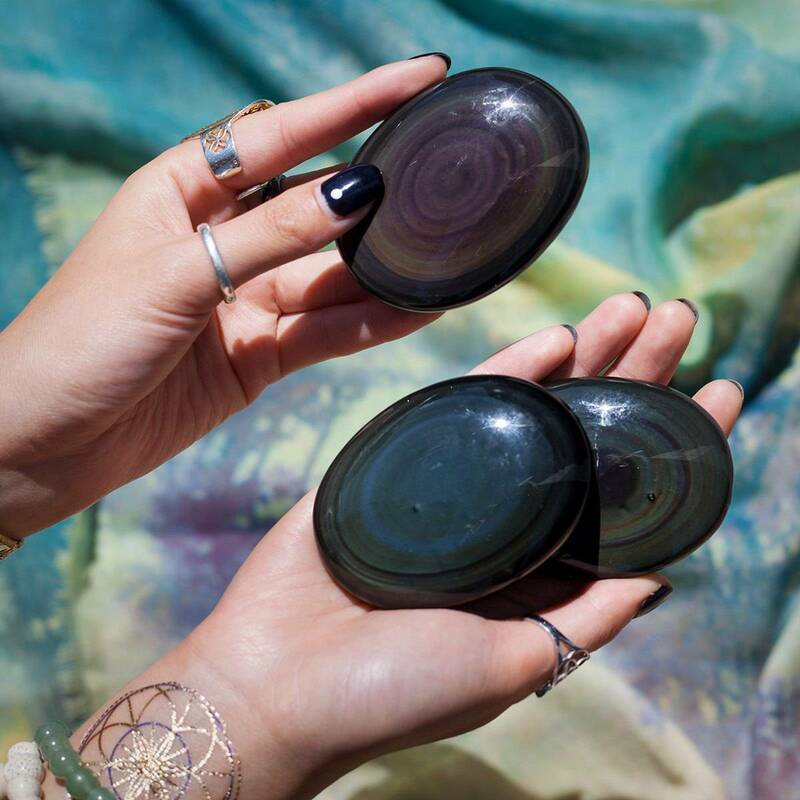 Place your stones on top of one of these SG custom engraved selenite discs, and get ready for the happiness. This gypsum gem is peaceful and gentle, yet potent and strong. And the tetragrammaton depiction makes each disc even more special. This sacred symbol offers us a link to other dimensions and the complexity of the multiverse we are currently existing in. It holds the secrets of All That Is, and is the origination of the modern day pentagram many of us work with. The tetragrammaton comes from the Greek Τετραγράμματον, which means consisting of four letters. In Hebrew tradition, especially in the Kabbalah, it is believed that this is the name of God, which when translated into Latin letters appears as YHWH, yod, he, vau, he. It is further thought that YHWH was probably derived from verbs meaning to be, to become, or come to pass. This Ineffable Name of God was considered so holy it could not be pronounced but once a year. However, in metaphysics, there is a theory that the tetragrammaton actually predates the ancient Hebrews and that it is not a name at all, but rather a mathematical equation for the essence of the Universe – which essentially is God in whatever form you choose. Furthermore, the root of tetragrammaton in Hebrew is HWH, which depending on where you look either means “being”, “life” ,”woman” or “destruction.” And when translated to Latin is Eve. I leave you to think about that. Now, if I may take you on a historical journey the funniest part (in my opinion) is that during Medieval Times, Christians lost track of the real meanings of the tetragrammaton, misunderstanding only that it was commonly written in magical books. Naturally (if you are familiar with Medieval christians) they assumed it was the name of a powerful demon. By the 17th Century this sacred symbol was described as a mighty devil whose business was to protect witches from persecution! The mystery of the tetragrammaton is no easily solved riddle. To some it is simply the geometric display of YHWH and nothing more than the name of God. To others, it goes much much deeper. Some believe it is direct link to the mysteries of the pyramids and ancient Egyptians, a cipher password to unlock their secrets if you will. There is a strong link to Pythagoras, and many theories in the realm of Sacred Geometry believe he is a key link between lost Atlantis and the rise of Egypt. I could turn tis listing into a novel to try to teach the depths of this sacred geometric symbol, but instead I encourage you to do your own research if this symbol calls out to you. Draw your own conclusions. Low frequencies naturally rise in the vibrational presence of selenite. As it purifies the energy in your space and attunes you to the Greater Good of all beings, it also connects you to the consciousness of your Higher Self. And the engraved design simultaneously invokes the magic of sacred geometry and the secrets of All. 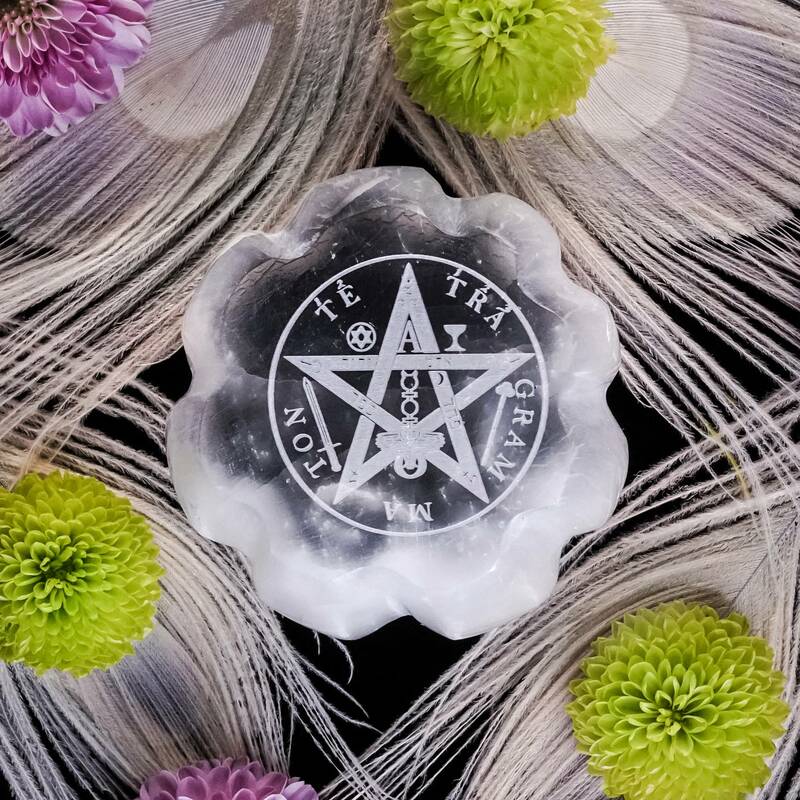 As you work with these tetragrammaton selenite discs, meditate on the tetragrammaton while you envision white rays surrounding you, your tools, and all who gather around you. 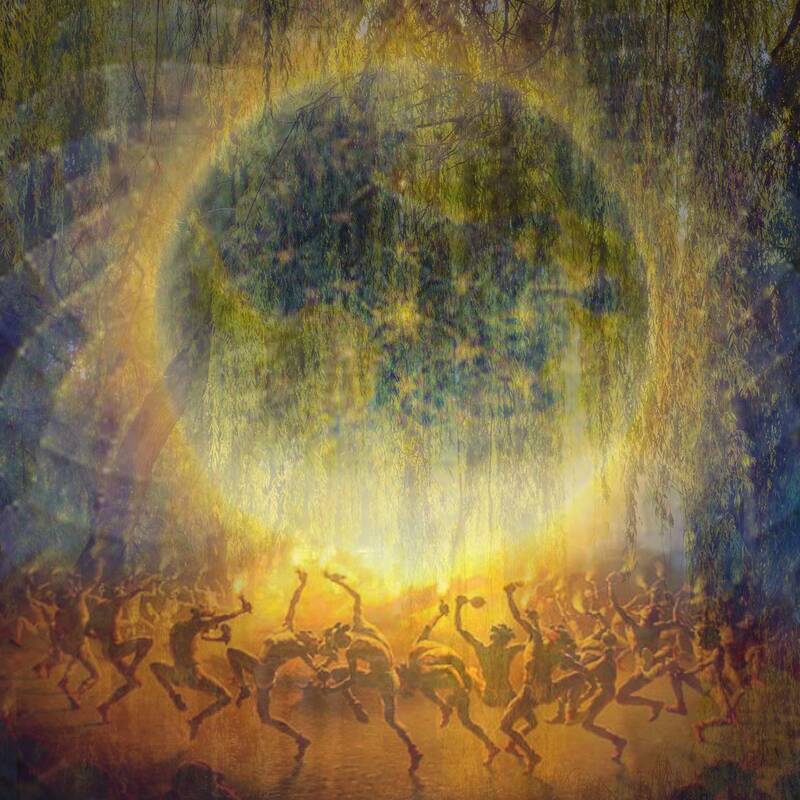 Envision your toroidal field and that of any others who gather with you. Absorb its energy and send it back out into the world. These selenite discs are especially powerful tools if you’re a healer, energy worker, or Reiki practitioner. As you work with yours, you’ll be amazed at how it generously infuses all surrounding energy fields with positive light. 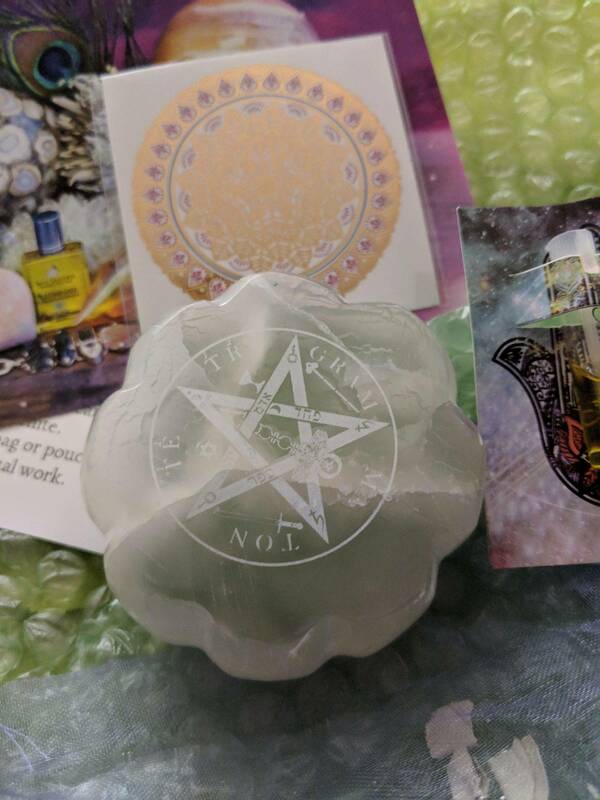 This listing is for one (1) tetragrammaton selenite disc, about 2.75-3″ in size. 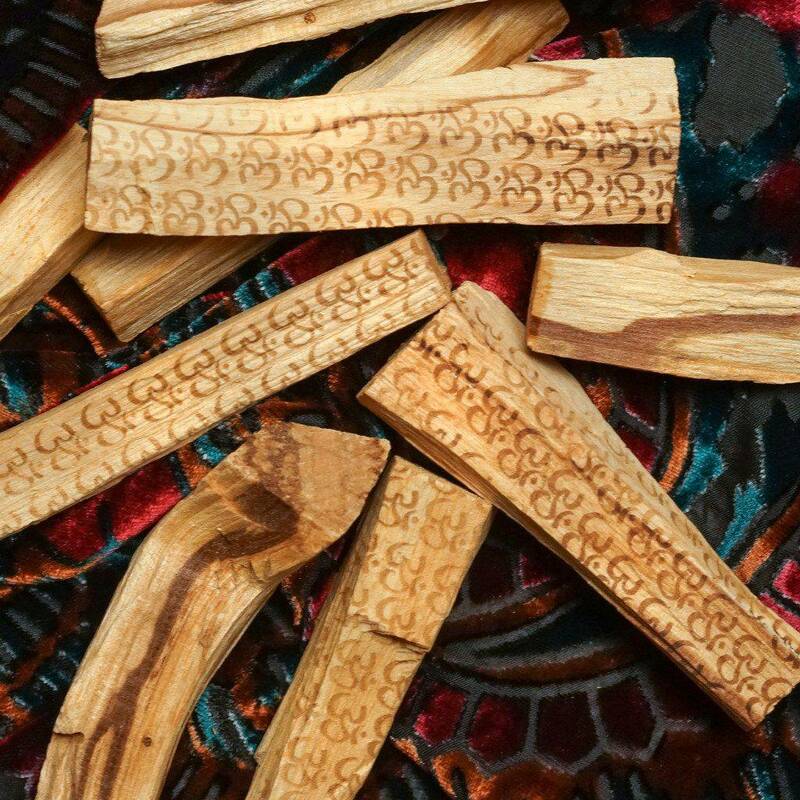 Yours will arrive lovingly parceled along with one white sage leaf you can use to clear energies. Not to over simplify, but this just makes me feel good, connected and empowered. It’s a gorgeous tool to cleanse tools, spaces and workings. Beautiful and solid – large too. I haven’t worked with it yet but after reading Athena’s description I now know how to work with it. Thanks! I don’t think this should be offered to everyone! When I hold this beautiful Selenite I feel an energy pulsing through my entire hand. Such powerful yet gentle energies. The print on my piece is quite faded so I must rely on the website photo for the imprint. Not a complaint as the energies are clearly imprinted into the beautiful Selenite.